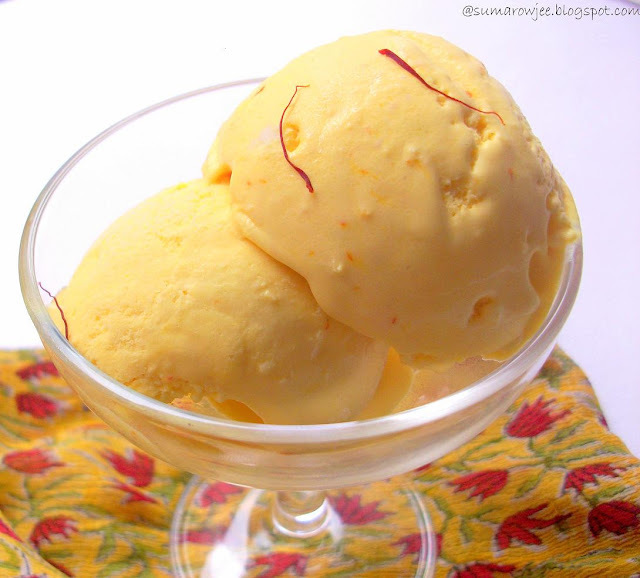 Cakes & More: Saffron And Coconut Ice Cream - Easy, Quick And Eggless Too! 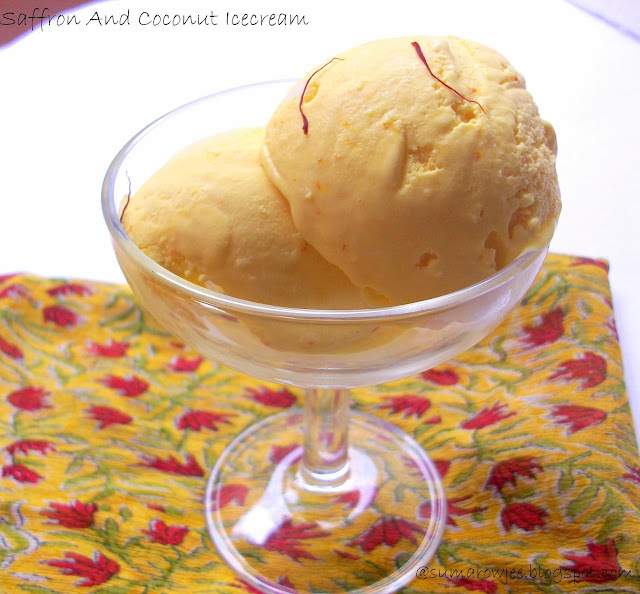 Saffron And Coconut Ice Cream - Easy, Quick And Eggless Too! In my opinion, there are broadly two categories of ice cream eaters. Those who eat ice creams wearing jackets, sweaters and caps even in winter too. Some people who pass by the ice cream store - shivering - just watching this sight! These are folks for who eating ice cream is warm weather fun. I belong to the former category, sans the winter gear. I love eating ice creams when it is cold and oh, even more when the sun is scorching away. When it is raining and when it is not raining. Generally, any time of the day, any season. I can't resist ice creams or anything sweet for that matter. Are you with me? The cool, creamy, finger and spoon licking delights come in a myriad of flavors with at least half a dozen outlets on every street and avenue. Isn't it then simpler and easier to just walk or drive down for one (or ask to be driven down, but I am sure you are not a hopeless driver like me)? Why bother to make your own ice cream? This was my amused sister's question to me, she had to roll her eyes of course. I guess, there are three reasons - First, you are obsessed with making all the chow stuff that you fancy. Second, you can have fun making it in your own flavors, and third and most important - you are crazy. I raise my hand for all the three reasons, both hands for the last reason. Are you still with me? And for all this madness and questions from saner folks around, I don't even own an ice-cream maker, yet! Not that I have made lots and lots of ice creams by now, but the few frozen delights I have whipped up, have made me put an ice cream maker on my top priority list. For example, can you buy Low Fat Pistachio Kulfi or get uber delicious, creamy Strawberry Mascarpone Ice Cream anywhere? Or get half the sense of satisfaction or fun when you eat store bought stuff? Rhetorical question of course (picture me looking very SMUG!). Did I mention, the satisfaction factor doubles triples when you manage to make really creamy, smooth ice cream without an ice cream maker. Armed with a simple recipe and tips from Monsieur David Lebovitz. Adapted from here .Original recipe from Delicious Days. Procedure ad verbatim from Monsier Lebovitz's blog : In a medium-sized saucepan, bring all the ingredients to a boil. Reduce the heat and simmer gently for ten minutes, stirring occasionally. 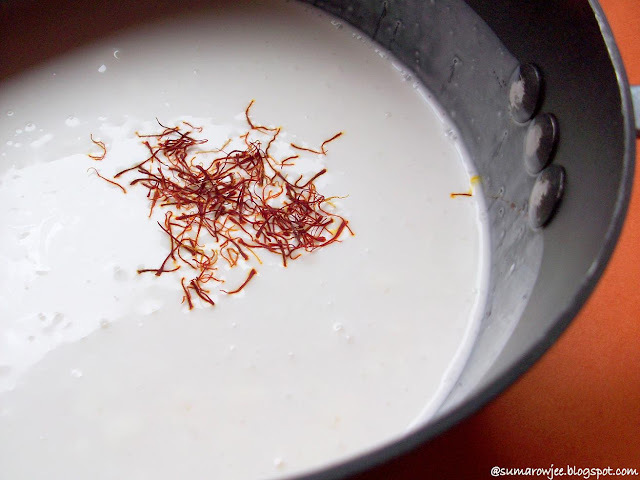 Remove from heat, and chill the mixture thoroughly. Once chilled, freeze in your ice cream maker according to the manufacturer’s directions. Once churned, be sure to scrape any saffron threads clinging to the dasher back in to the ice cream. I have cooled the mixture, then used a freezer safe box to put the ice cream mixture in. Used my hand mixer to break the ice crystals at intervals, blended in the same box. The mixture was too little and I did not want to share some of it with my blender jar every time I blended. I have blended about 4-5 times and then froze it overnight. Thanks to Monsieur Lebovitz, this will be made again! coconut ice cream is something i can have anytime of the day. I add a little bit of freshly grated coconut for some texture. love your recipe. Wowoie!! A homemade icecream with the flavour of coconut!! Oops sorry, I think you have it already! got a bit too excited with the first half you see..
looks creamy and mouthwatering...bookmarking this. Rich looking super inviting icecream,unfortunately am having sore throat,else would love to make some immediately..will try them soon. Nice recipe..ice cream looks yumm!! That icecream looks so rich, creamy and yum! Great clicks! Suma, your ice cream looks absolutely perfect. Stunning colors from saffron. You should soon rush to Jamaals in Forum Value Mall, Whitefield. Your Ice-cream maker machine is waiting for you there! I saw it there last week and was super tempted to buy one. They have a Kenwood. Had it not been my hubby eyeing my purchase, by now it would have adorned my kitchen counter! dear suma,tried this icecream last night with neelgiris fresh cream(40% milk fat). you are right even a tiny bit of saffron masks the flavour of coconut, but i liked it that way. its very creamy and delicious(made with out an icecream maker) thank you so much. Mouthwatering ice cream,looks very yummy and love the presentation. I made this and served it with black sticky rice and toasted coconut on top for a bit of crunch! Yum yum!